Sunday 25th October 2015, the day dawned a perfect Autumn day, bright blue sky and not a breath of wind. Ideal conditions for a leap out of a plane at 10,000ft over Salisbury Plain. 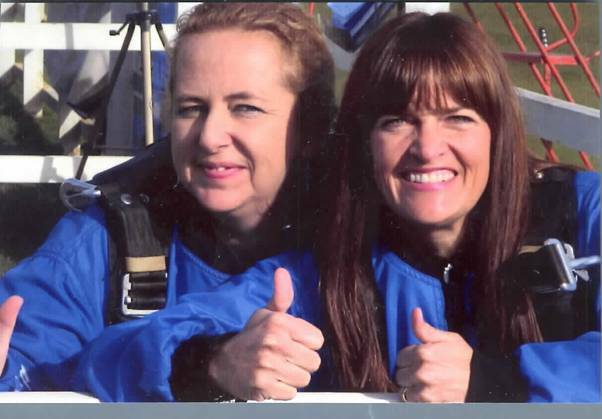 Sam Weston, our intrepid Client Services Manager and Helen Coles, our courageous Xero Manager, were up and away into the blue horizon for the jump of their lives. ‘I absolutely loved it’ said Sam, ‘and we have beaten our target of raising £1000 for the great Bristol charity, St Peter’s Hospice’. Actually the duo raised over £1200 from the generosity of friends and family, and the staff and clients of Evans & Partners. A big thank you to everyone who sponsored them. Helen said ‘It all seems quite surreal now, at least we survived! It was a great experience and for such a great cause’. Evans & Partners are proud members of the St Peter’s Hospice Corporate 100 Club. This comprises 100 Bristol companies all dedicated to raising over £1000 per year for Bristol’s only adult hospice. For more information about St Peter’s Hospice click here.